SILVER and GOLD PRICES whipsawed their friends again today. The gold price pitched off its chair and hit the floor, down $13.60 (1.25%) to 1,073.90, near the bottom of the range. Silver toppled 40.8¢ to $13.734. Understand the problem: a generally sound strategy is to buy near the bottom of an established trading range. Drawback is that the more times that support is tested, more likely it will give way. More’n that, this ain’t normal, friends. 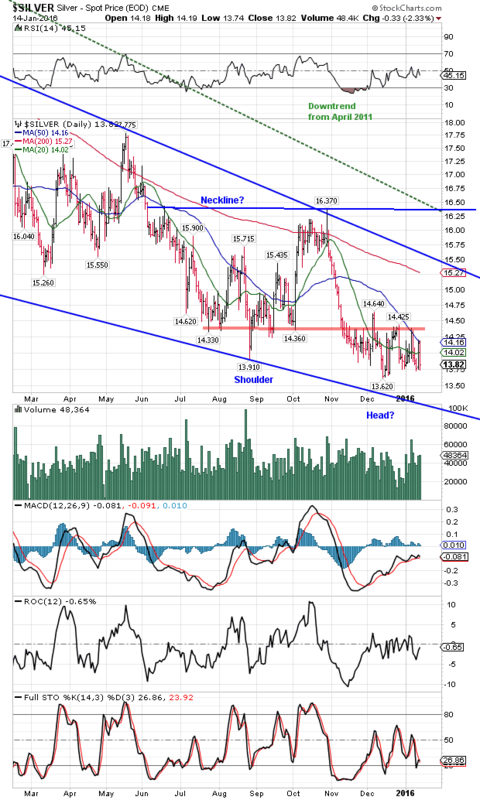 Have a look at the 5 day silver chart on the right, Looks like a mesa in New Mexico. Wednesday up 40¢ at a single bound, today down 40¢ in a single bound. Markets generally don’t act that jumpy. Clearly there some magic at $14.05 that either boosts or cripples silver, which has no stomach for trading in-between there and $13.85. Passing odd, but I won’t pull down the deus ex machina and talk about Nice Government Men hitting the gold market through the silver market in order to keep money panicked out of stocks from flowing into gold. No, I am too much a gentleman to expose their naked undercarriage that way, even though no less than the Wall Street Journal itself chronicled that in its December 1987 report on how the Fed and the yankee government handled the 1987 stock market collapse. No, sir, I won’t bring up old crimes like that. Rather, I could just attribute it to a thin market and stop orders clustered at the same place, as they were apparently clustered around $1,080 in the GOLD PRICE today. 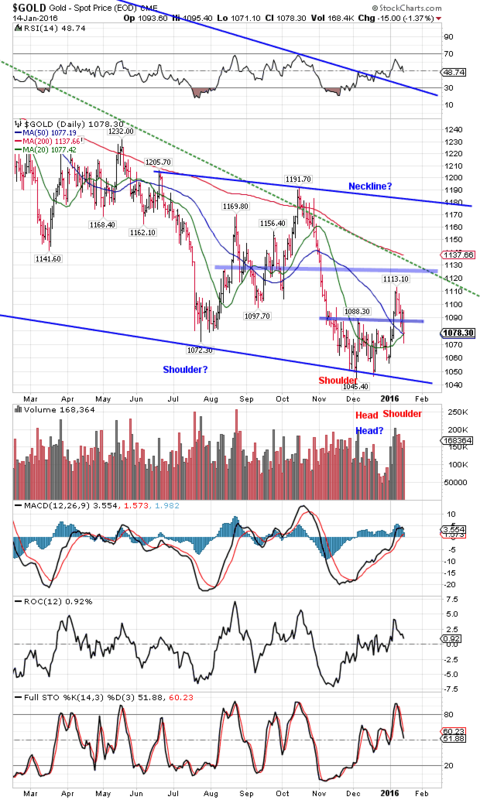 Then I backed off the silver and gold charts and took a longer view. Go back to June, and from June through September (for silver) or October (for the price of gold), there appears a great dip and return rise. Then another deeper dip begins and scrapes bottom across November and December. If silver and gold are trying to reverse, then this pattern would answer: an upside-down head and shoulders. That also means they can’t trade below the recent lows, $1,045.40 for gold and $13.62 for silver. Right underneath both is the bottom of a falling wedge a-forming since 2013, which ought also support them. Here, I’ve marked it out on charts on the side. Whatever the next move, I am patient. Those folks who listened to a wild-eyed nat’ral born durned fool from Tennessee back in 1998 – 2002 and sold stocks for silver and gold are sitting still on gains large enough to compensate for the pain of the last 4-1/2 years. Not satisfying to the nervous soul, but to the calm a balm. A friendly reader from Hamburg in the international shipping trade corrected that Zero Hedge report about no ships between the USA and Europe. The writer checked the wrong website; the seas are not quite empty yet. However, the greater problem in international shipping is a bubble caused by a world awash in cheap cash. As with all suckers for bubbles, investors thought they knew it all and, armed with cheap borrowed money, saw to it that the market was oversupplied with ships to the choking point. My friend also implies that the cargo flow of dry bulk commodities remains quite steady. Zero Hedge’s report erred and spotlighted the wrong problem. The real one is probably worse. Given the oversoldness of stocks, a rebound is about now in order, just to work off their present oversold state. Markets are like pendulums (pendula?) swinging back and fort from overbought to oversold. But this analogy fails because there is an OVERALL DIRECTION to those swings that keeps taking a market up or down. Anyway, a rally to relieve oversoldness is not a change of primary trend, although green folks might think it so. Dow today added 227.64 (1.41%) to 16,379.05. 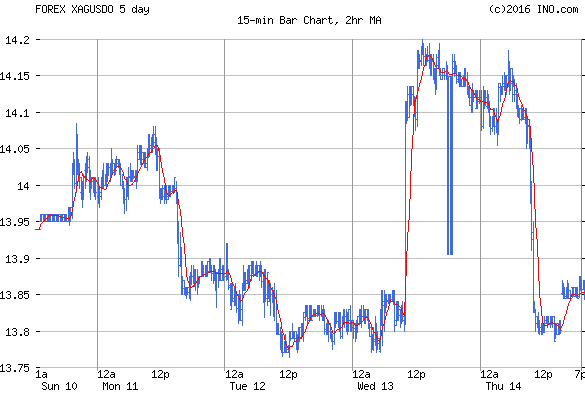 S&P500 beat it with a 31.56 (1.67%) gain to 1,921.84. Dow could rally to 16,800, S&P500 to 1,960. However, this is no more than a rally in the midst of a strong downwave, so don’t get caught long. Bear in mind that bear market rallies can be strong as a garlic milkshake, thanks to scared shorts chucking their losing positions overboard. Once they lose that gas, however, they quickly collapse. US dollar index continues in reluctant uptrend, rushing like a kid going toget a whippin’. It’s stepped out into an even sided triangle so far into the nose cone that it must break one way or t’other soon. As it stands above the 20 and 50 day moving averages, up has the odds. Those odds are increased looking at the Yen, which appears to have worn the new off its rally, and to be crawfishing off an extremely overbought cliff. Dropped 0.34% to 84.70. Nor does the euro show any trace of ambition, losing 0.12% to $1.0867. Nasty, nasty fiat currencies, vectors of parasitism and sorry poverty. Pasty white undead corpses, like Vlad Dracula, servants of hell. Any of y’all keeping up with where I stand on fiat currencies? Any doubt? Before my eyes close in death I pray to see the end of ’em.